As you all know, the windows in my classroom were changed during the Summer. The new panes are not covered by a thick mesh, hindering my view of the outside. Instead, the new window protectors are thin and barely noticeable. The view from my window has also changed. Now I see the new play structure and the green of the pristine soccer field and running track. 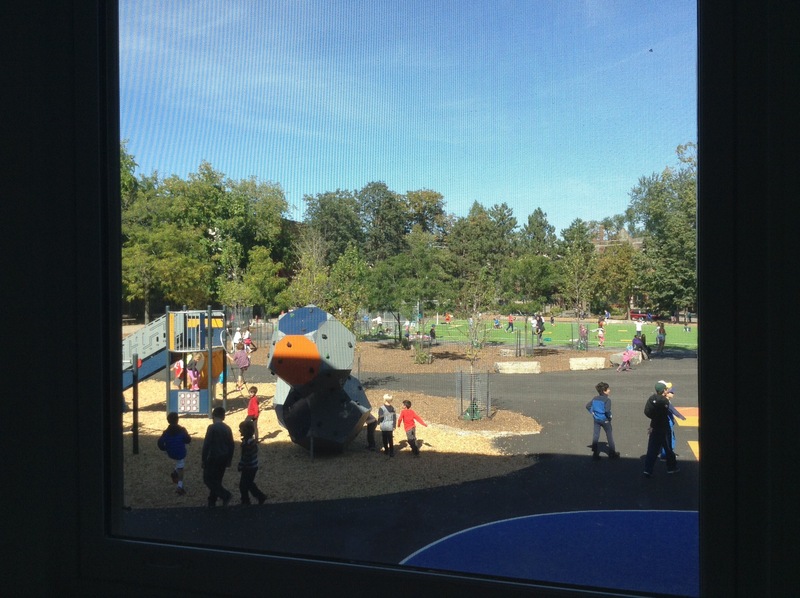 When I work from my desk in my classroom, I can enjoy the sight of children at play as well as the pleasing aesthetic of the newly renovated grounds. What do you see through your window at work? Happy children at play. What a lovely view! What a nice view you have. That view reminds me of the elementary school I pass on my way to work (if I am taking the train). I think class starts at 9.00 am, but children start arriving just after 8.00 am and do nothing but run and play. It is such a refreshing sight to see. I enjoy seeing and hearing children at play. It is so joyful.